A deep, interesting trading sim that demands unnecessary amounts of patience. Atmospheric, ambitious and frustrating. 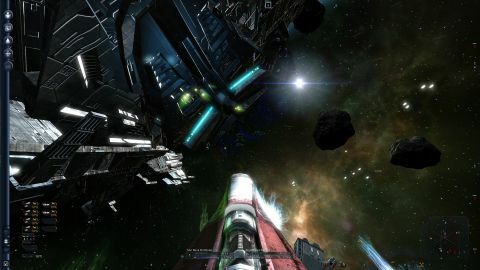 The Albion Prelude expansion to X3: Terran Conflict adds a healthy dose of war to the exploration and freeform space trading sim, along with 30 new ships and a dynamic stock exchange designed to liven up X3's commerce. The tension between expansionist human colonists and the alien races that occupy the X universe has finally ignited, triggering a massive space war. X's hungry corporations are taking advantage of this to create new business, and there's plenty of room for a lone entrepreneurial trader to make millions. That lone trader is one of a series of pre-made starting profiles that present differing angles on the conflict. You can sign up as a fighter in the army and play through a lengthy series of combat missions. You can become a well funded intelligence agent in charge of building fleets. You can become a space pirate desperately trying to scrape out a living in the face of pursuing law enforcement agents. In typical X style, from these jumping-off points, you can go anywhere and do anything you like. This sounds much more glamorous than it actually is. The ambition of Albion Prelude is undermined by the tedium and plodding pace of every basic action. As a trader you'll be picking up goods from one part of the universe and selling them for a profit a few systems away. The new stock exchange function throws open much of the behind-the-scenes workings that drive X's economy, an excellent addition for those who want to play X as an absorbing galactic numbers game. But the act of docking, loading up and shifting your goods around to take advantage of a gap in the market takes so long that I often forgot what I was supposed to be doing by the time I reached my destination. The space battles are much better, and act as a great showcase for the considerable graphical updates made by the expansion. Albion Prelude's combat ships aren't lithe enough to allow for proper dogfights, and there's not much depth to the action, but the spectacle and sheer volume of lasers involved makes the combat pilot a good way in for new players. The campaign objectives get repetitive quickly, however, and there's almost no guidance or tutorials to guide you round X's multi-layered interface. When one battle went bad, I headed for the nearest stargate and deserted. “Sod this, I'll become a space pirate!” I thought. An hour later I found myself lost in the void, wading from system to system, still trying to find the first rung on the galactic trading ladder. If you're willing to put up with the pace, Albion Prelude's simulation of a universe in turmoil provides the most dynamic and interesting sandbox yet presented by the X series. If interacting with it wasn't such a pain, Albion Prelude would be a tremendous achievement.